Linz ( /ˈlɪnts/; German pronunciation: [ˈlɪnt͡s]) is the third-largest city of Austria and capital of the state of Upper Austria (German: Oberösterreich). 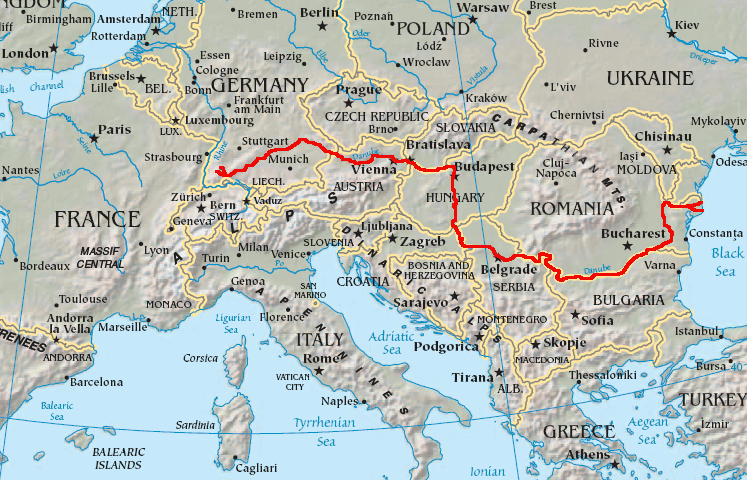 It is located in the north centre of Austria, approximately 30 km (19 mi) south of the Czech border, on both sides of the river Danube. The population of the city is 191,107, and that of the Greater Linz conurbation is about 271,000. Linz is located in the center of Europe, lying on the Paris-Budapest west-east axis and the Malmo-Triest north-south axis. The Danube as the main tourism and transport connection that runs through the city. Another famous citizen was Anton Bruckner, who spent the years between 1855 and 1868 working as a local composer and church organist in the city. The Brucknerhaus is named after him. Adolf Hitler was born in the border town of Braunau am Inn but moved to Linz in his childhood. Hitler spent most of his youth in the Linz area, from 1898 until 1907, when he left for Vienna. The family lived first in the village of Leonding on the outskirts of town, and then on the Humboldtstrasse in Linz. After elementary education in Leonding, Hitler was enrolled in the Realschule (school) in Linz, as was the philosopher Ludwig Wittgenstein. Notorious Holocaust architect Adolf Eichmann also spent his youth in Linz. To the end of his life, Hitler considered Linz to be his "home town", and envisioned extensive architectural schemes for it, wanting it to become the main cultural centre of the Third Reich. In order to make the city economically vibrant, Hitler initiated a major industrialization of Linz shortly before, and during, World War II. In addition to an ordnance depot, Linz has a benzol (oil) plant which was bombed during the Oil Campaign on 16 October 1944. What was once the Mauthausen-Gusen concentration camp is 20 kilometres (12.42 miles), east of the city of Linz. Linz is one of the main economic centers of Austria. The Voestalpine AG is a large steel concern (founded as the "Hermann-Göring-Werke" during World War II), which is known for the LD- ("Linz-Donawitz") procedure for the production of steel. The former "Chemie Linz" chemical group has been split up into several companies. These companies have made Linz one of Austria's most important economic centers. The city also has a central station (German: Hauptbahnhof) on Austria's main rail axis, the West railway, linking Vienna with western Austria, Germany and Switzerland. There are also varying types of river transport on the Danube, from industrial barges to tourist cruise ships. Local public transport is provided by trams, buses and trolleybuses, operated by Linz Linien GmbH (part of Linz AG). The Pöstlingbergbahn is a tramway which climbs a small mountain at the northwest edge of the town. The city is now home to a vibrant music and arts scene that is well-funded by the city and the state of Upper Austria. Landestheater Linz. Between the Lentos Art Museum and the "Brucknerhaus", is the "Donaulände", which is also referred to as "Kulturmeile" ("culture mile"). This is a park alongside the river, which is used mainly by young people to relax and meet in summer. It is also used for the Ars Electronica Festival and the "Linz Fest". Linz has other culture institutions, such as the Posthof, which is near the harbour, and the Stadtwerkstatt, which is by the Danube river. The Pflasterspektakel, an international street art festival, takes place each year in July in and around the Landstraße and the main square. Linz was the European Capital of Culture in 2009, along with Vilnius, the capital of Lithuania. The recently built Lentos (2003) is a modern art gallery, presenting art from the 20th and 21st centuries. It is situated on the south banks of the river Danube. The building can be illuminated at night from the inside with blue, pink, red, and violet, due to its plastic casing. The Ars Electronica Center (AEC) is a museum and research facility on the north bank of the Danube (in the Urfahr district), across the river from the Hauptplatz (main square). The AEC is a significant world center for new media arts, attracting a large gathering of technologically-oriented artists every year for the Ars Electronica festival. The AEC museum is home to one of the few public 2D CAVEs in Europe. 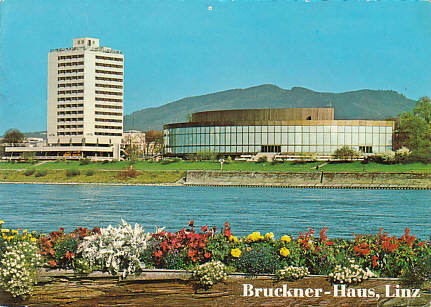 The Brucknerhaus, a famous concert hall in Linz is named after Anton Bruckner. It is situated just some 200 meters away from the "Lentos". It is home to the "Bruckner Orchestra", and is frequently used for concerts, as well as Balls and other events. ^ "Klimadaten von Österreich 1971-2000 -Linz" (in German). Central Institute for Meteorology and Geodynamics. http://www.zamg.ac.at/fix/klima/oe71-00/klima2000/klimadaten_oesterreich_1971_frame1.htm. Retrieved 2012-09-06. ^ Press release Air Berlin. Retrieved 21 March 2011. ^ Linz Linien GmbH for Local Transport. Linz AG. Retrieved 2010-08-29. ^ "Pflasterspektakel Festival". Magistrat der Landeshauptstadt Linz. http://www.pflasterspektakel.at/eng/index_default.asp. Retrieved 2010-07-24. ^ "Andrew Edge". Andrew Edge. http://andrew-edge.blogspot.com/. Retrieved 2008-04-06. ^ "Sister Cities of Linz". http://www.linz.at/english/life/4612.asp. Retrieved 2011-10-27. "Linz". New International Encyclopedia. 1905. This page uses content from the English language Wikipedia. The original content was at Linz. The list of authors can be seen in the page history. As with this Familypedia wiki, the content of Wikipedia is available under the Creative Commons License.